Des and Ian have decided not to publish their blog for the 2018 season. Photographs and video clips from their travels over the last ten years can be made available upon request. They can be contacted by email at bluestid@gmail.com or by text message to 086 055 0235. Their Travels With the Blues Facebook page will continue. 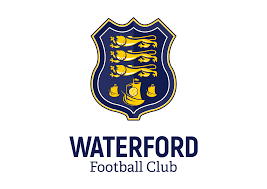 This is an independent Waterford F.C. fan blog. It has no connection with the club and the views expressed in no way represent the views of the club or any of its officials. All readers of this blog take careful note that its content is not to be published or reproduced in any format without the permission of the authors via the contact details below. Thomas, Bryan, Morrissey, Maguire, Morley, McGeough, Casey, Hale, O'Neill, Buck and Matthews ..... awaiting the next generation.